Open to all families regardless of affiliation or school attended. Our rich curriculum includes Hebrew & Mitzvah learning as well as Torah & Holiday enrichment. 10 am-12 pm on Shabbat mornings in the Chapel. Parents welcome too! All are included in leading parts of the service, t'fillot (prayers) to reading Torah! When a child comes of age it is a simcha for the immediate family, the synagogue family, and the entire Jewish community. Maccabees is a social group that meets monthly on Sunday afternoons. Join us for fun activities with a Jewish twist! SMP is the cornerstone of educating our young congregants. 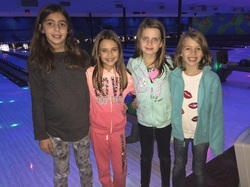 All children entering 5th Grade and above who plan to celebrate a Bar/Bat Mitzvah at Adath Jeshurun are required to attend the program for 5th – 7th Graders. Amos & Celia Heilicher Minneapolis Jewish Day School provides kids in kindergarten through eighth grade a positive environment focused on a strong academic foundation in Jewish and General Studies.